Highly migratory species (tunas, billfish, sharks) are some of the most fascinating animals on the planet. 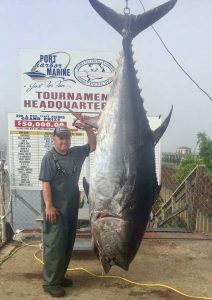 Species like bluefin tuna, for example, have been important almost since the dawn of civilization. Described in detail by Aristotle, painted onto cave walls, stamped into currency, used as a food source and now a product in commerce there is probably no other fish with such prominence in our society. Crossing entire ocean basins, elevating their internal body temperature, swimming to depths in excess of 5000 feet within minutes and navigating with the precision of a GPS in an otherwise featureless environment is simply remarkable and something many HMS species do with regularity. Globally, commercial tuna fisheries account for more than 33 billion dollars and including their recreational component exceeds 45 billion conservatively. While their value is high, our understanding of their life history is not. Plagued with uncertainty, stock assessments for HMS species often lack basic information like age structure, stock delineation, predator prey interactions, size at maturity, indices of abundance, basic sampling, fecundity and more. My lab’s research is applied, working on these and many other aspects of HMS life history to improve stock assessment models and reduce uncertainty in their current and future projections. Every project I have requires the participation of commercial and recreational stakeholders, without whose help and dedication this work could never be completed. People wishing to work in my lab can expect to get dirty and spend time on the water with the various fishery components. Doing both of these things will give you a better perspective and understanding for both the science and the fishery.